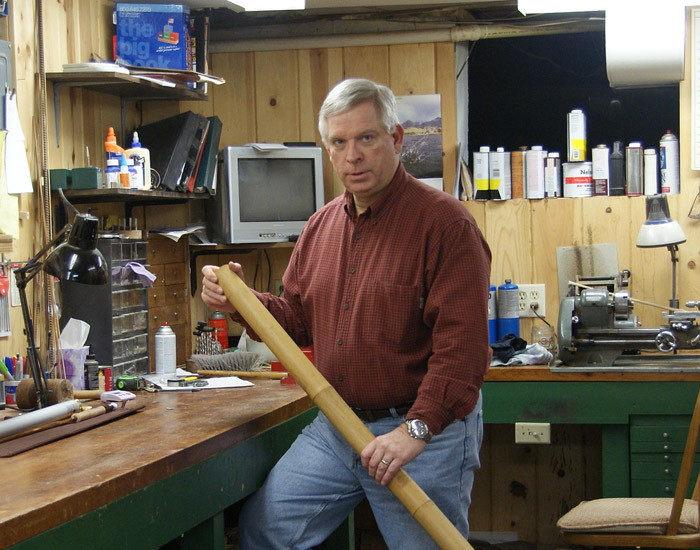 Established in 1979, the D. G. Schroeder Rod Company designs and hand crafts custom split-cane fly rods. It takes great skill and years of study to master this art, and the time I have devoted to refining techniques is evident in each rod created. But don't be taken in by the beauty alone; these rods are also functional. They have a crisp, medium fast action, that promotes smooth, accurate casting. Rods are individually handcrafted, at my shop in southern Wisconsin. Planed from the finest aged Tonkin bamboo available, the rod is finished in a deep, rich, cocoa hue, with golden nodes. The mortised reel seats, whether of the aluminum-uplocking, or the nickel silver sliding band type, boast a burled wood filler, and are also made in my shop. Hand selected "Flor Plus" cork is lathe turned to form the grips. Hand wrapped tan silk, accented with wine tipping, secures the hard chrome snakes and the Carboloy stripper guide. Super-Z ferrules further enhance performance. All rods come with two tips- mirror images are a standard feature. A brass capped aluminum tube, reinforced bag, and machined ferrule plug are included.